Switch up your ordinary grilling seasoning with a little Asian influence. Serve over rice with a grilled veggie. Trim the fat from the steak. Cut several slits in the steak. Combine all ingredients in a bowl and marinate at room temperature for 30 minutes. Place the steak on the grill and set the marinade aside. Now, in a separate sauce pan, bring the reserved marinade to a light boil, stirring constantly. Flip the steak and baste with about half of the cooked marinade. 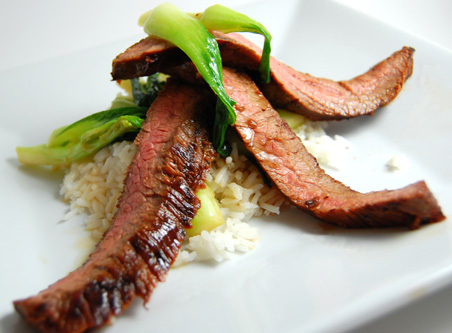 Since flank steaks are typically pretty thin, make sure no to overcook. Serve over rice with a veggie. Add a drizzling of the reserve marinade on top.